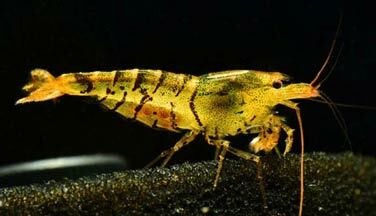 If the basic tiger shrimp does not interest many aquarists (although we personally find it very beautiful! 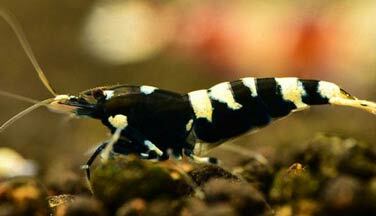 ), The more advanced selections like Black Tiger and Blue Tiger are quite sought after. The maintenance of this shrimp is a little more complicated because it requires more attention than most fish. The female is bigger than the male. Its antennules are smaller than those of the male. How to feed the Tiger shrimp? Shrimp are scavengers and algivorous. They will therefore find a good supply of food in an aquarium already run for some months. Complete anyway its diet, for example with spirulina (to be distributed once a week). Cabbage, spinach, zucchini and dried nettle leaves will also be swallowed with pleasure. Quickly remove uneaten food to avoid polluting the water. What kind of behavior does the Tiger shrimp have? Very peaceful, Caridina Cantonensis Tiger shrimp have a very good sociability. They spend most of their time meticulously searching every single piece of substrate and leaves in the lower part of the aquarium. Because of their "prey" nature, shrimp tend to hide. To reassure them, plan a group of at least 10 individuals. They will be more active, show more and will be more inclined to breed. Who can live with the Tiger shrimp? 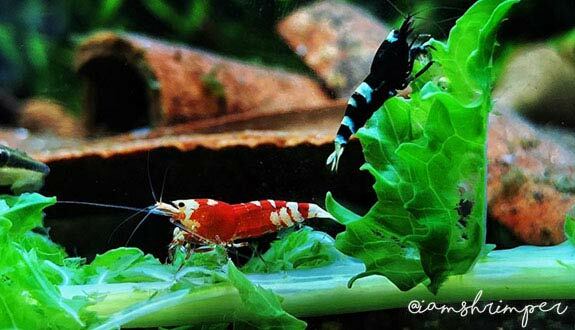 For adult shrimps, cohabitation with some species of small, quiet fish is possible. However, predation of large fish should be avoided. Where this becomes more problematic is for safe cohabitation with nascent young shrimp. If you want to keep many small shrimps, prefer neighbors like Corydoras or Otocinclus. Some aquarists also report successful cohabitation with Microrasboras Galaxy. However, pay attention to your water parameters. How to breed the Tiger shrimp? Very easy, since spontaneous in the presence of both sexes and if the maintenance parameters are well respected. The temperature should be 22/23°C or 71/73°F. The shrimp group must also be large enough for them to feel comfortable and begin to breed. Once fertilized, the female places the eggs under its abdomen and will keep them for the entire time necessary for incubation (18 to 28 days). You will see it breaking its eggs regularly. A female can give birth to thirty small shrimps every 2 to 3 months. At hatching, young shrimp are small replicas of adults, and are perfectly independent. If your shrimp live in a community aquarium, plant the aquarium thoroughly to have a chance that a few individuals will survive. Which aquarium for the Tiger shrimp? The volume of the aquarium does not matter. In fact, it is especially the available floor space that must be looked at. Indeed, shrimps spend a lot of time digging the ground, so they need space! Choose a rectangular tank wider than it is tall, with a good length. The main parameter to respect is the hardness of the water. It must be as gentle as possible. For this, cut your water with reverse osmosis water. Caridina Cantonensis Tiger will be more tolerant of temperature and pH. To be closer to natural conditions, stabilize your parameters as follows: pH at 6.2/6.5 - GH at 5, KH at 0 and temperature at 22/23°C or 71/73°F. It should be noted that water that is too hot brings closer moults, and therefore reduces their life expectancy. 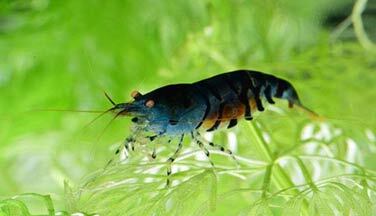 This shrimp does not tolerate the pollution of its water: do not overeat your animals and make a renewal of water up to 10% weekly. Pay attention also to the use of medicines or fertilizers (refer to the instructions for use before any treatment of this type). For comfort, plant their aquarium densely. They will appreciate hiding places and shady places. Mosses such as Fissidens fontanus, Riccia or Java moss are essential for their well-being and will provide shelters for young shrimps. Note that the maintenance of this shrimp does not require technical soil as for Caridina Cantonensis Crystal. Neutral soil like Manado will suffice. What are the colours and patterns of the Tiger shrimp? 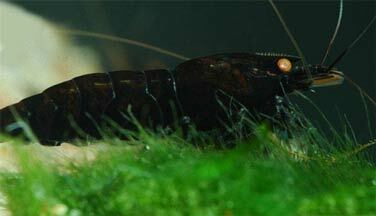 In its basic form, the Tiger shrimp has a gray robe striped in dark brown or black. Its head and tail are usually yellow. The different successions of selections gave rise to entirely black varieties (with loss of stripes) or to the blue. 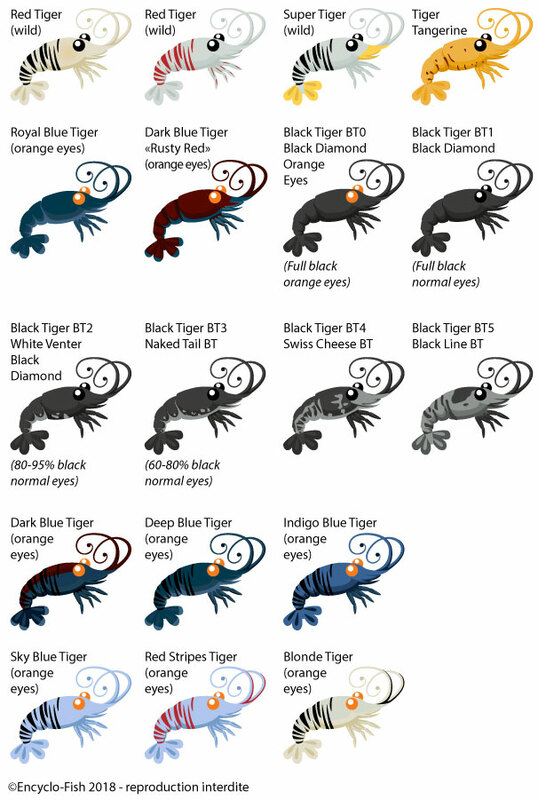 The shrimp colour "basic" is more robust than the varieties that have resulted from the original one (Black Tiger, Blue Tiger...). Cohabitation with Caradina Cantonensis Crystal (Red, Black or Golden), White Bee, Breviata or any other Tiger of different colours should be avoided because of the risk of hybridization. In case of crossing a Tiger and a Taiwan Bee, we speak of a "Tibee". That of a Tiger and a Tibee gives birth to a "Taitibee".